We've started in October and will end in June. All those games, all those goals, all those ice girls. It's time to put your money where you mouth is and away you go. The New Jersey Devils will take on the Los Angeles Kings for a chance to lift Lord Stanley of Preston's Chalice. 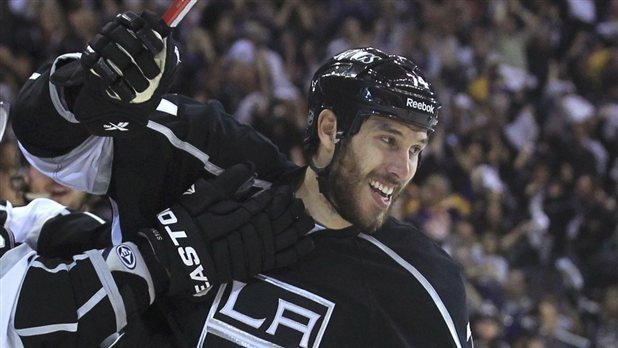 Los Angeles Kings will win the Cup in six games. Ummm...well....I don't know. It's hard to hate on the Cinderella story and the fact they have been so dominate in a tough division as the last seed....it's almost a fool's bet to bet against them. Sure, I get that Martin Brodeur is going for another Cup to maybe end out his career, and while the Devils have been playing pretty decent selfish hockey....the Kings have really been too good over the top-three seeds in the West in succession. Sure, they haven't been pushed, but the fact the Kings have been pushing teams of that caliber around is not only good for their confidence, but really a warning to the Devils that they can't take them lightly, even as an 8th seed. Luckily, with no horse in the race and no team I really hate-- I can enjoy this series and whoever wins it will deserve it and have a story to tell. BE DIALIN' Don West, Young Man, BE DIALIN'!! Forget Bob Hartley going to Montreal, what I'm about to present to you could be one of the bigger front office moves made, but won't be given that much publicity because it's a small market and a lower lever team-- but boy howdy-- what a move. Rumor has it (from wrestling dirt-sheets) that the Wenatchee Wild of the NAHL, a Tier II Junior A league in the USA Hockey Program is about to announce former Shop-At-Home sports card guru and Total Nonstop Action Wrestling announcer Don West as their next General Manager. It adds to the lexicon of wrestling and hockey being intertwined. For those who don't know Don West, here's some video action of what he has brought to many a TV screen late at night. You cannot deny the energy and selling power West will bring to the table. It will draw a lot of attention to the team and maybe generate a few more ticket sales to people who remember him from his baseball card selling days or wrestling announcer days. But, the question must be asked: What does Don West know about hockey and about management?? The answer right now-- not much about either. 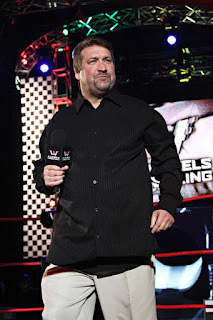 West is a Purdue University graduate in broadcasting, then went on to be the pitchman at Shop-At-Home, hosting his own sports talk show in the Nashville area in 2001, then onto TNA wrestling as the color commentator. Aside from that, West has really nothing in way of management skills or hockey background when it comes to it all. Of course, the dirt sheets could be COMPLETELY wrong in the reason why Don West is leaving, because it's so very random; but if this does come to fruition-- I know I'll pay more attention to the NAHL and Wenatchee Wild. Yet, is that the only reason the Wild are doing this or thinking of doing this-- the publicity?? Because if so, it's quite the short-sighted idea and could be the start of the death kneel for the team in itself to hire a guy with no experience for such a position. Sure, it's not like he's going into the NHL and trying to run stuff, but the fact he really has no known hockey background or upper management background, it could make his team a sitting duck unless they surround him with a lot of knowledgeable people or he knows more than he lets on....it just seems like a crazy gimmick to attract attention-- which it has. It may not be the best business move on the surface, but from a publicity stand-point, GENIUS. And if, in fact, West does trade ten mixed boxes of wax packs for a top player; then he's craftier than we gave him credit for. Last night, the Shawinigan Cataractes won the Memorial Cup on home ice, defeating the London Knights in overtime. It was the second straight season the QMHL has won the Memorial Cup and the ninth time the host team has won the Memorial Cup. In the 1982-83, the Canadian Hockey League said they would expand to a four-team tournament, including the three league champions and a host team. Now, the caveat in the early years is that the teams had to make it far enough to qualify to play in their own barn. Only once since 1983 did only three teams play and that was in 1987 when the OHL decided to hold a "Super Series" between Oshawa and North Bay. Oshawa won the series, as well as beating North Bay in the OHL Finals, thus making only three teams for the Memorial Cup. While some people believe hosting the Memorial Cup gives that team an unfair advantage or is a silly objective; the number really don't support that theory in the long run. Here's some fun facts before my take. So, when you look at it, 31% of the team who host the event, which isn't horrible, but it's not like the trend is a big deal or something to be considered silly. A more surprising stat could be the teams who hosted that didn't win their league-- because what has happened at some times in the past is that when a team get selected to host, a lot of NHL teams would talk to the Major Junior teams that their prospects belong to and ask for them to be traded to the host team because they would be with a competitive team and be seen in meaningful games. It would also help the team in gaining attendance if premier prospects are on the roster. Though the idea of having a host team is a little bit interesting, especially when you see that Shawinigan, who was the second seed in the QMJHL, didn't make it past the second-round of the playoffs. Even though they did play exhibitions against some decent talent during their break, the fact they had more of a rest than other teams could have played to an advantage. They may not have been as good as the other teams, but rested legs would play crucial to a tournament like this. Even so, the host team is a valuable status symbol for teams. With the big business that Major Junior hockey has become across North America, to get the event would be big for the local economy and national exposure of the city. If a "small" town gets the event, it's a huge boom and get the fans into the whole event, if they wouldn't be already. It centralizes the game and has the focus in one place rather than having it going back and forth between cities. However, it's just a thing that could work for Major Junior hockey and not professional leagues. As we get ready for the Stanley Cup Finals, we look at one goalie who has a strong connection with one of the teams and you could say he started the ball rolling with gathering their first win in their first game in their first season. While he wasn't around long, he cemented his spot in a short time. This week, the profile of Wayne Rutledge. Rutledge started his venture to notoriety playing in Junior "C" with the Newmarket Flyers for the 1958-59 season, but moving onto the Junior "A" ranks with the Barrie Flyers in the 1959-60 season, putting up a 24-18-6 record in 48 games. The Flyers would move to Niagara Falls in the 1960-61 season, appearing in 47 games with a 22-20-5 record, while playing in 43 games in 1961-62 with the Flyers, but no record is given. In the 1962-63 season, Rutledge turned semi-pro-- bouncing around a couple of leagues with the Clinton Comets in the Eastern League for five games, then four games for the Kingston Frontnacs of the Eastern Professional League (3-1-0) before settling down with the Windsor Bulldogs of the Ontario Hockey Association Senior league, playing in 30 games and helping the Bulldogs to the Allan Cup Championship as best Senior League team in all of Canada. Rutledge would play 65 games for the Bulldogs in the International League, but there's no record on record. Rutledge settled in the Central Professional League, even though he may have been bumped around for a couple team. He started in the 1964-65 with the St. Paul Rangers, where he would compile a 22-16-1 record in 39 games. 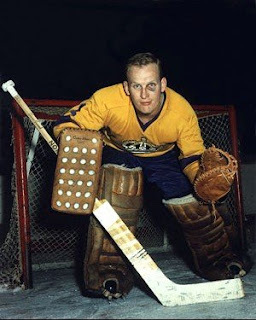 As the team rebranded as the Minnesota Rangers in 1965-66; Rutledge found his niche, putting up a 34-25-11 record in 70 games, leading the league in shutouts with seven and would be named to the Second All-Star Team, as well as have the fewest goals-against for the season. The New York Rangers had a deal in place for Rutledge and would place him with the Omaha Knights in the 1966-67 season, going 36-24-10 in 70 games, garnering First All-Star Team honors for his efforts. The Rangers left Rutledge unprotected for the 1967 Expansion Draft, where he'd be picked up by the Los Angeles Kings. Rutledge would split time with the legendary goalie Terry Sawchuk that 1967-68 season and put up a 20-18-4 record in 45 games (and 1-1 in three playoff games), including starting and winning the first game in the Kings history on October 14th, 1967-- a 4-2 win over the Philadelphia Flyers and first shutout in December of 1967 over the St. Louis Blues. The 1968-69 season saw Rutledge struggle, playing in only 17 games with a 6-7-4 record (1-3 in five playoff games), while he only appeared in 20 games in the 1969-70 season, going 2-10-1; while also making stops in AHL with the Springfield Kings for six games and the Eastern League with the Long Island Ducks for three games. The Kings placed Rutledge in the Western League for the 1970-71 season with the Denver Spurs where he would put up a 15-18-12 record in 47 games. During the Reverse Draft, the Salt Lake Golden Eagles picked up Rutledge from the Kings where he would play the 1971-72 season-- playing 60 games with a 24-27-8 record, which was enough for Second All-Star Team honors in the Western League. Rutledge was drafted by the Houston Aeros in the 1972 WHA Draft and would move to the WHA for the 1972-73 season, posting a 20-14-2 record in 36 games, while posting a 3-4 playoff record. Though he put up only a 12-12-1 record for the Aeros in the 1973-74 season, Rutledge was along for the ride as the Aeros won the Avco World Cup for WHA Champions. The playing time bounced back for Rutledge in the 1974-75 season; going 20-15-0 in 30 appearance, then going 14-10-0 in 24 games and 1-2 in the playoffs during the 1975-76 season. Rutledge finally got a decent chunk of time during the 1976-77 season, playing 42 games and putting together a 23-14-4 record, but would see his time drop in the 1977-78 season-- playing in only 12 games and finishing off with a 4-7-0 record. Rutledge would leave the Aeros for the OHA with the Orillia Terriers, where he would play in 17 games before hanging up the pads for good. Sadly, in October of 2004, Rutledge would pass away due to stomach cancer at the age of 62. It took a while for Rutledge to get into the NHL, including a couple of off-the-map stops, but thanks to expansion-- he was able to get his shot and seal his spot in the history of an organization. When the expansion team showed their real colors, he moved to another league and tried to dazzle as much as he could. He stuck it out and made the most of this time out there. Another top-seed is done and while many Rangers fans were looking to repeat 1994, Martin Brodeur was too much almost two decades after the fact. With the block party the Rangers brought, John Tortorella got the team deep into the playoffs and even with all the hurdles they had-- European trip, road-trip while MSG was bring renovated, HBO 24/7-- the Rangers did what they could and almost made it there. They did get a lot out of Marian Gaborik in the regular season, potting his third 40-goal season in the past five; while Brad Richards didn't shoot out the lights in his Broadway debut season, but he did enough when he was needed to help keep the Rangers in it during the playoffs. The supporting cast chipped in when needed, but would mostly be known for their grit, board play, and shot blocking than anything else. Of course another bright spot is how well Carl Hagelin will develop. He has the speed and hands, but will he be able to flourish as much as he is capable of in the Rangers' system of play?? Defensively, Dan Girardi and Michael Del Zotto were the offensive leaders, but Del Zotto's defensive play makes Rangers fans cringe and angry at him. Luckily, the return of Marc Staal and solid play of Anton Stralman were able to make-up for Del Zotto's short-comings. However, we all know the crown jewel for the Rangers is Henrik Lundqvist and his 1.85 playoff GAA, .931 save percentage, and three shutouts are spectacular. It mirrors his regular season numbers nicely, as well (1.97, .930, 8 SO); but the fact he has come so close again with a great team in front of him and not be able to muster out a conference title makes you wonder how long he can deal with these shortcomings in the playoffs. While it's much too early for harsh criticism to be brought in, the fact that he has come up short again-- despite how much press he gets for being an amazing goalie-- makes me wonder if Lundqvist will be the Dan Marino of the NHL where he's able to do so well in the regular season, but come up short of the ultimate prize at the end of the day. There's a long way to go, but you had to think that this was one of the best chances he could have gotten with this team. They will be back to the drawing board in New York and they will have to hope that John Tortorella's motivation will be able to continue going and that his game plan continues to ring in the Rangers locker room. It was looking good for the Phoenix Coyotes-- they got another possible owner, they got further than anyone had ever thought and deeper than ever in history; they shocked the world. Then they hit a road block that was the LA Kings and even trying to underhandedly get their shots in, hacking and whacking away; they couldn't get their bounces and are now out-- wondering if they'll be around at the start of the next season. While many will see this as a valiant boost for the team, it could be the worse thing for them if they under-perform next season. It's one thing for Mike Smith to do this during the second-half of the season, but if he should return to Earth, you know the questions will be there again. The defense in front of Smith was solid, as Rusty Klesla, Oliver Ekman-Larsson, and Keith Yandle played solidly on both ends of the spectrum. 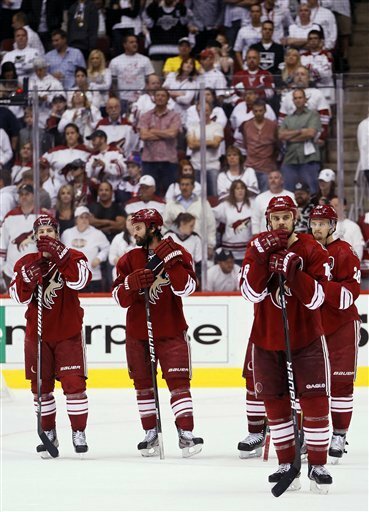 The offense was not very dominant, but the Coyotes never have relied on that much. However, Ray Whitney and Radim Vrbata were the top dogs for the Coyotes in the regular season, while Antoine Vermette, of all people, led the way in the playoffs. Shane Doan was contributing where he could and did what he could to make his fairytale playoff continue, but it wasn't enough in the end. Yet, the last memory that the Coyotes will have this playoff season was the end of Game Five and the interviews afterwords. The players swarming to the referees after the Kings game-winning goal, arguing over a non-call half-a-minute earlier, then the hyperbole that came from their mouths talking about it-- it may have left their most hardened of supporters shaking their heads. While Yandle's comment about the Coyotes not having an owner made them a sitting duck because no one is there to defend them, this far exceeds passion of a team losing to a team pouting over sour grapes. Many saw the true colors of the Coyotes, including Shane Doan, who's intense play was bordering on dirty; but many gave him the benefit of the doubt. This team needs an owner and whether or not they stay in Arizona, who cares-- but a leadership is needed for this team to actually know they have someone in their corner. Even if they have to move to Kansas City, they need more support from the top down. As the Memorial Cup is going on in Shawinigan, Quebec; this week's AGM was able to capture the Memorial Cup after an unlikely road to the junior championship after a rocky first couple of seasons, However, he was able to get into the NHL for a short time, then build his way to a career after hockey. This week-- the profile of Steve Guenette. Guenette started off his career with the Gloucester Rangers for 31 games in the 1981-82 and 1982-83 season. In the 1983-84 season, Guenette would move onto the OHL's Guelph Platers, going 9-20-1 in 38 appearances. The 1984-85 season saw Guenette play in 41 games and compile a 16-22-4 record. 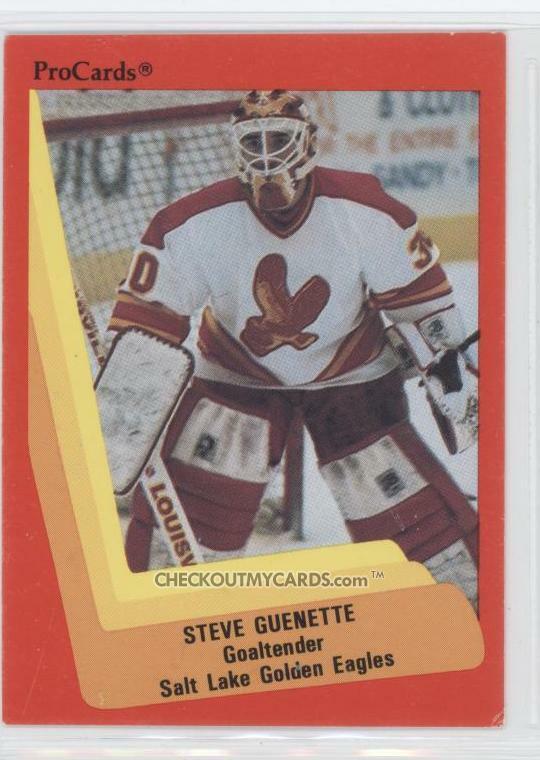 The breakout year for Guenette was the 1985-86 season, where he would finish with a 26-20-1 record in 50 games, then going 15-3 in the playoffs-- helping Guelph win the J. Ross Robertson Trophy for league champion. Moving onto the Memorial Cup, Guenette went 3-1 in four games, taking home the Hap Emms Trophy for top goalie in the Memorial Cup and All-Tournament team. After that last season, Guenette was signed by the Pittsburgh Penguins. In the 1986-87 season, Guenette spent most of the season playing in the AHL for the Baltimore Skipjacks, going 21-23-0 in 50 games, while getting called up to Pittsburgh and lose both his appearances. The Pens moved their primary affiliation to the IHL's Muskegon Lumberjacks, playing in 33 games with an impressive 23-4-5 record, then getting called up to Pittsburgh for 19 games and putting up a 12-7-0 record. That season, Guenette captured the James Norris Trophy for fewest goals against in the IHL. Guenette spent the first part 1988-89 season as a back-up in Pittsburgh, getting into only 11 games (5-6-0), while spending 10 games with Muskegon (6-4-0). The second half of the season would be after Guenette was traded to the Calgary Flames for a draft pick. Guenette stayed in the IHL, but with the Salt Lake Golden Eagles and go 24-5-0 in 30 games to round out the season. The 1989-90 season had Guenette stay in Salt Lake, playing 47 games and finishing with a 22-21-4 record, while spending two games in Calgary-- going 1-1-0. Guenette would be back in Salt Lake again for the 1990-91 season, finishing with a 26-13-4 record in 43 appearances, as well as winning the only game he played in Calgary that year. During the summer of 1991, Guenette was traded to the Minnesota North Stars for a draft pick, but he would be put back in the IHL with the Kalamazoo Wings. He would play 21 games and finish with a 7-9-3 record before finally hanging up his pads for good. Currently, Guenette has dipped his hand into home improvement, working as a partner for Roofers World, which manufactuers and distributes roofing products across North America. Guenette is also a part of the Ottawa Senators Alumni team, as he lives in the Ottawa region and is accepted into the team's alumni group. After a slow start, then a quick rise to the top in the juniors-- the struggles on the pro teams and the logjam that happened made Guenette bounce around from team to team, mostly getting stuck in the minors. However, he's still active with the Sens alum and made a great career choice outside of the game. With the John Druce-esque emergence of Dwight King for the Los Angeles Kings, it offers a vast amount of King playing for both the name on the front and back, especially since they're the same. But there are a few more players who have had the same name as their team's logo and played for said team, with King being in the spotlight now due to his amazing play this playoffs. The interesting part of it all is that King is the only player with that surname to play for Los Angeles. There have been ten players and one coach with the last name King, Dwight is the only one to play for the Kings; making it fun to deal with, but also redundant. While King is plying his trade in the NHL, the London Knights in the OHL have Jared Knight, the overage forward from Battle Creek, Michigan. Knight put up a point-per-game mark during the regular season (26g, 26a in 52 games) while chipping in four goals and eight points in 15 playoff games. The Boston Bruin second-round will be looking to move his talents to the pros next season, probably in the AHL to start off, but moving upward. Sadly, Knight will have to leave the team moniker fun-fact behind as it's all Bruins from this point forward. Yet, even while those last names are fantastically fun to deal with-- when you have an entire name that's the team's nickname-- then you know you have something. The Brandon Wheat Kings of the WHL had a player from Brandon play on their team....who's name was Wheaton King. Whether or not the family planned it that way to pay homage to the local junior hockey team, but the fact he was able to make it to the WHL and be able to play (albeit only in 48 games over two season), will forever cement this player as one of the most unique names to be associated with a hockey club. King did play three games with the Moose Jaw Warriors this past season, but this could be the last we have hear of the young King, as with many major junior players, he may fade away without getting the stardom he thought he could have. All in all, the NHL really doesn't give much leeway for players to have the same name as their logo, but luckily-- you do have a few gems out there, which will cause a little bit of notice on that player; especially if they start to make their mark on the playoff stage. Yes, 1994, we get it. That's the last time these two have met in such an event like the Conference Finals. Oddly enough, Martin Brodeur is still in the league and still with the Devils. Even with that as a backdrop and with the whole ideal of this being a closely proximate event; defensive hockey will rue the day of it all. The Devils got the highest compliment from Ilya Bryzgalov after the last round, saying the Devils didn't let anyone else play. The puck possession game, along with the long defensive roots the Devils have should stymy any offense that the Rangers could try to muster up, which isn't much considering they are 11th of the 16 playoff teams in goals per game (2.07). Though Marian Gaborik and Brad Richards have been able to come though in the clutch, you have to wonder how well they'll deal with the Devils defense. The Devils on the other hand will have to deal with Henrik Lundqvist and the Rangers block party; who have let up the second least goals-against-per-game, only behind the Los Angeles Kings (1.86). Ilya Kovalchuk will have to be at the top of his game against the Rangers and in pressure situations. And while the Devils have the defensive stigma, the Rangers have been able to stop and block everything-- with the Devils going scoring the most goals 5-on-5 so far with 24 goals, you have to think that they work better with more havoc on the ice. 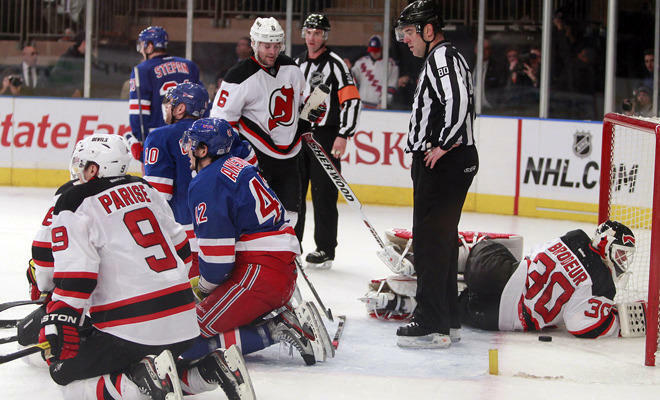 Though the Devils really haven't faced the most defensive teams, which should help the Rangers in the end. 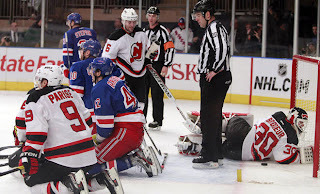 The Rangers haven't scored too much, but also have a lot of even-strength goals; but with the traffic the Devils will have and clamping down on the neutral zone and allowing very little shots-per-game; the Rangers will need to find a way to break through it all. Yet, much like all the playoffs-- it'll come down to the goalies. The new hotness of Henrik Lundqvist or the old and busted of Martin Brodeur. Lundqvist could be the guy who, if he can't get past this round, maybe labeled like the Dan Marino of the NHL, being really good, but never getting a championship. Sure, he's been around a few years-- but you never know how long a goalie can last nowadays. On the flip side, the long-tenured Marty Brodeur is ready to go and maybe have one last shot. The system has helped Brodeur in the past and doing it again this year. If he can stop the shots he sees, there's really no stopping him because he will have an easy task. PREDICTION: While it may seem daft, the New York Rangers will win in six games over New Jersey. It won't be the most glorious of roads to the Cups-- the Rangers beating the 8th, 7th, and then 6th seed to the Cup Finals-- but to get there is all that matters. Lundqvist will be (and has to be) the deciding factor to it all. While many teams credit one player who actually contributed in a good way to saving a franchise, this week's AGM is a guy who's short-comings helped the franchise for the better. However, it changed the way things were to happen in the NHL, but for a short time-- he changed the NHL. This week, the profile of Vincent Tremblay. Tremblay started his journey with the Quebec Remparts of the QMJHL starting in the 1977-78 season, where he would go 19-21-4 in 50 games. In the 1978-79 season, Tremblay would go 24-27-10 in 66 games, allowing him to garner Second All-Start Team honors in the QMJHL. The Toronto Maple Leafs would select Tremblay in the fourth round of the 1979 NHL Draft, immediately putting him into their system in the 1979-80 season, where he would split time between the AHL's New Brunswick Hawks for 13 appearances (4-3-0) and for the Maple Leafs for 10 appearances (2-1-0). In the 1980-81 season, Tremblay would setting in with New Brunswick, playing in 46 games and finishing with a 24-12-8 record, while appearing in three games for the Leafs, all losses. 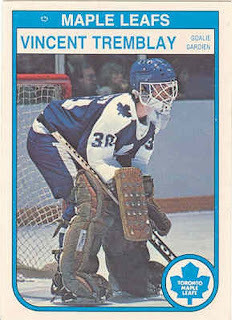 In the 1981-82 season, Tremblay would have his chance to be the starter for the Maple Leafs, playing in 40 games, but would compile a 10-18-8 record. The 1982-83 season, Tremblay saw himself in the AHL for most of the season for the St. Catherines Saints, playing there for 34 games (sadly, no record is around) and then play one game for the Leafs, not factoring in the decision. In the summer of 1983, Tremblay would be traded to the Pittsburgh Penguins with Rocky Saganiuk for Nick Ricci and Pat Graham. This trade would be something interesting, as history would have it-- even if it meant that we have a Draft Lottery because of it. So, you see-- the 1983-84 season had Tremblay buried in the AHL with the Baltimore Skipjacks, playing in only 28 games there with a 10-8-7 record, but an interesting call-up changed the franchise of the Penguins forever. Tremblay was called up by the Penguins and would start in four games. He would lose all four and then be demoted back to the AHL. This is important because the draft system is the team with the least amount of points would get the top pick and all the losses would be better for a better pick. Because of those losses, the Penguins had the worst record, allowing them to pick Mario Lemieux with the first overall pick in the 1984 Draft. The whole story is over at the aptly named blog "The Legend of Vinny T."
In the 1984-85 season, Tremblay would be playing in the AHL with the Rochester Americans under a minor league contract for 33 games, putting together a 13-10-8 record, which allowed him to get a contract by the Amercians' parent team-- the Buffalo Sabres-- despite Tremblay never playing for them. He would also play in the New Brunswick Senior League with the Riverview Trappers. After that season, Tremblay would retire. While not much was made of his short career, Tremblay may have done more good for the Penguins organization than anyone could imagine, even if he was a pawn to the system and would be the cause for the lottery system to be implemented into the NHL Draft lexicon. Two teams that many counted out before it started, two teams who no one thought would get out of the second round, two teams who will now fight to see who will get the Stanley Cup Finals. The Pacific Division will be represented in the Finals for the first time in five years. Obviously, the big match-up is going to be Jon Quick and Mike Smith-- who will be more frustrating to solve. Smith has had many adventures away from the net, but his recovery and smothering style is going to be tough for the Kings to deal with. While he doesn't have much star help in front of him, Smith and the Coyotes know how to get the job done. Quick has been equally as amazing and really has used his strong defense to help him out in the past couple of series. It should be an interesting chess match for both sides. Offensively, the Coyotes have gotten a lot from their blue-line with Keith Yandle and Rostislav Klesla providing seven points apiece; but how much space will they see with the Kings covering their points a little better than teams playing before them?? Antoine Vermette has also played very exceptionally well, as has Mikkel Boedker. The Kings have had their big guys be their big guys-- Dustin Brown being the leader they expected him to be, Anze Kopitar has been a great playmaker, while Mike Richards has been getting his magic back from the Flyers 2010 Playoff run. Even Dustin Penner and Justin Williams are getting into it-- and I don't think Jeff Carter has peaked just yet. In the end, it's a question of how well Dave Tippett and Darryl Sutter coach off each other. Both have been great at the chess match and got the pairings against the top lines perfect. Both are proven in the playoffs and now it's just a matter on who you'd rather have making the big decision when it needs to be made. While Sutter may have more weapons at his disposal, Tippett may have the better cohesive unit around him. 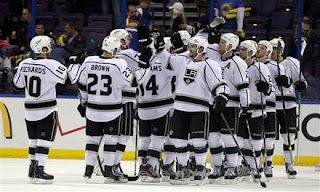 PREDICTION: This one will go the distance, but I think in the end-- the Los Angeles Kings will outlast the West. They have a solid coach who has been there before and changed the team's demeanor. Jon Quick has been amazing and I don't think we've seen the best out of the Kings top stars just yet. As a fan of this team since 1988, this is a heartbreaking one for me to write, but the 7th seed had their magical season ended by the top-seed in the East. While they did find a new goalie for the future, the fact that the offense is the question mark is a real head scratcher, but the Capitals will need to see how they can readjust and find a balance to be successful. The best part about the playoff run is that, by injury happenstance, Braden Holtby became the defacto #1 goalie for the Caps. 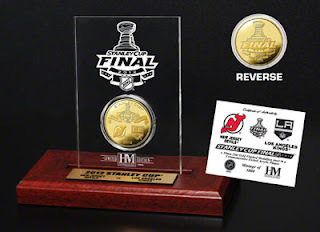 With Tomas Vokoun's flop of a season and Michal Neuvirth mounting injuries; Holtby came in and gave an outstanding performance to keep the Caps in many of the games and being the deciding factor in their wins. Should he keep his usual mantra in the net, Holtby could be the guy to take over the carousel that has surrounded the Caps since Olie Kolzig left. Yet, the strongest point for the Caps in the past seasons was the one that many question-- the offense. Though you can look at Nicklas Backstrom being injured to stifle the offense for a bit there, but with Alex Ovechkin and Alex Semin there; it should be no problem. You can say the defensive scheme hindered them-- and it may have-- but big time goal-scorers find a way to score in the situations when they present themselves. Ovechkin and Semin didn't find those situations and thus, their production was hindered. It's the last we could see of Semin in North America. Another thing that could hinder the Caps is too many character players. You can always say that you can't have too many-- but when you have over two lines of grinders more than skill players, you limit your chances of actually sustaining much of an attack. Even though they are good for the room and you see the speed that guys like Jason Chimera, Brooks Laich, and the hands of Matt Hendricks have-- the fact they don't translate too much into big scoring chances will hurt in the long run. The shutdown pair of Karl Alzner and John Carlson really showed their maturity this year, with Alzner really stepping up as a stay-at-home stalwart. That said-- the task on what to do with Mike Green and Dennis Wideman will be seen. Green has been homegrown, but also injury proned. Wideman was a trade-deadline pick-up and hasn't played awful, but can you keep both or do you have to chose one?? It could all come down to dollars and cents to decide that fate. As a whole, the Caps season was more successful than many thought going into the playoffs. With the limbo of Dale Hunter's status as head coach next year up in the air, it's something that need to be decided before you look at changing anything around. If he gets a full season, Hunter could make this team better.....or frustrated. Always a crapshoot with the Caps. It took me a couple days to register this, but the fact that the Philadelphia Flyers are out is a little bit....mind-boggling, but not unexpected. When you trade out the captain, a top-scorer, and then lose your new captain to a concussion-- it's a surprise a bit that the Flyers were able to make it as far as they did. Of course, this all started with the amazingly heavy deal they gave to their goalie, Ilya Bryzgalov. With eight years left at $5.6M per, you have to think that the Flyers and Philly fans are hoping for an amnesty buy-out in the new CBA. Granted, this is Bryz's first time in the spotlight in a big hockey market. The HBO presence probably didn't help either. Yet, it adds to the downfall and short-shelf life of Flyers' goalies since Ron Hextall's first stint with the Flyers. The big question is if Bryz leaves, can Sergei Bobrovsky or anyone else make things better?? 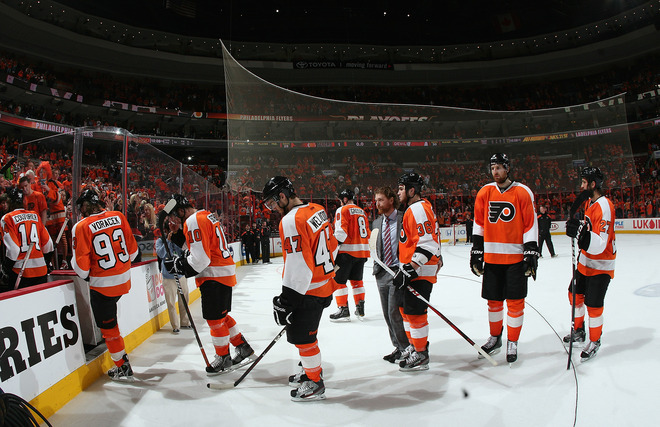 Defensively, the loss of Chris Pronger didn't help, nor did the loss of Andrej Meszaros late in the season; but as a whole-- the Flyers stayed as strong as they could with what they had. Though, the prospect of losing Kimmo Timonen next season, even with one year left on his current contract, would be a big hit. Luckily, Brayden Coburn and Nicklas Grossmann will be back and will be the cornerstones to the new wave. However, they'll have to play very tight in order to actually help out whoever is behind him. And while Mike Richards and Jeff Carter were shown the door (and are now together in the Western Final), the offense did play well and it was able to get new faces up there; including the emergence of Claude Giroux. Sure, he shoulder blocked Dainius Zubrus in Game Four, but other than that-- he played amazingly for the Flyers-- helping out Scott Hartnell and a returning Jaromir Jagr produce as well. Even with all the good points, it was shock in Philadelphia for the playoffs. The bright spot is that the Flyers did beat the Penguins, winning the Keystone Cup. However, in their second round-- they looked like the Keystone Cops, running around and not producing much of anything. It's another long off-season; looking for a more propserous future. Just when you get over the hurdle of the Detroit Red Wings and you think you're cruising-- something hits a bumps and next thing you know-- the Nashville Predators are out of the playoffs. And now, with an unknown summer looming as far as free agent defensemen go, the Preds will wonder if they'll ever clear that second-round hump. More over, the whole controversy with what happened to Alexander Radulov and Andrei Kostitsyn after Game Two into Games Three and Four-- you have to wonder if a misjudgement by punishing two solid scorers for another game could be Barry Trotz's undoing. I'm sure it won't be, but for a team who only scored nine goals-- six in the first two games-- you would need all the offensive power you could muster. Which is another thing you could look at in the undoing of the Preds was not scoring when needed. 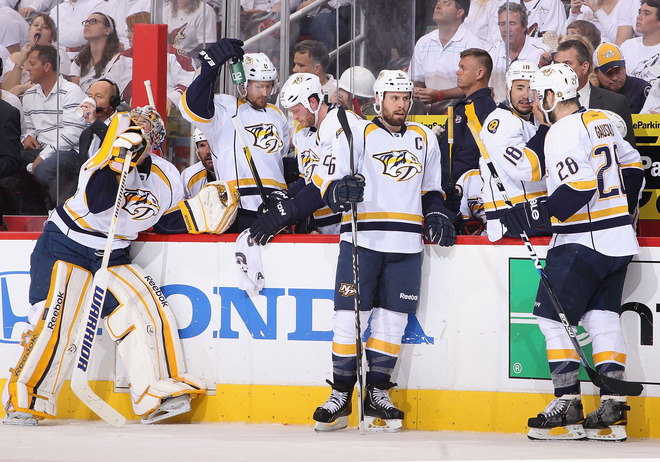 The team only had one 20+ goal scorer in Mike Fisher and had three guys with a high of three goals in the playoffs. While the addition of Radulov was wishful thinking, he only contributed one goal in the playoffs--which is something that many expected wouldn't happen. On the defensive side, it's the biggest question on whether or not the Preds can retain both Shea Weber and Ryan Suter or if one or both will be going away from Music City, USA. Weber is the captain and probably will be the guy the Preds will want to retain; but he's also a restricted free agent, which helps and hurts the Preds, while Suter is the UFA. The loss of either would be huge, as Weber and Suter were 4th and 5th in team scoring, respectively. For a defense first team, the Preds will exhaust everything in order to try and keep both. Pekka Rinne is the only constant for next year, as his extension gave him a little hangover after he signed, but his first 40-win season and Vezina nomination shows that Rinne will be the cornerstone of this Preds team moving forward. Though, having some help in front of him would help a lot. It will be something to behold what the Preds do, but it will be a lot of head-scratching after a season that should still be going came to a screeching halt. Once John Carlson scored the go-ahead goal for the Capitals in Game Five against the Rangers, the CBC crew wondered how much more time Alex Ovechkin, Alex Semin, and Nicklas Backstrom would get the rest of the game, as the Caps have been know to go into full defense mode after taking a lead. Almost on cue, the Caps started playing the grind players more and seemingly playing a 0-1-4 scheme on the forecheck; something I'm sure not done before in recorded history. Yet, that's what "Hunter Hockey" seems to be for the Caps and coach Dale Hunter, get the lead and start to play more defensively responsible, which is good when people buy into it. It seems that the Caps have done that, with even Ovechkin getting into the blocked shots category and putting the team before himself, almost learning maturity on the fly for the often criticized captain. And while the Caps were able to create some odd-man rushes in the third period, including a Backstrom shot off the post; the fact the Caps keep collapsing into their goalie when they have the opponents seem to be crashing on Braden Holtby would do more harm that good. Even so, the style the Caps have could have lead to the game-winning goal with the style of blocking the Caps do-- Tebow-esque, as I would call it. Sure, the Caps actually learning a defense-first thing is solid, but there's still kinks it and the transition game could be a little stronger; but it's a learning process. It may not be the best time to keep learning during the playoffs-- but that's another story for another time. But back to the point about their blocking style-- which teams will figure out, especially if you're playing a team in a best-of-seven series. Much like a new goalie, at the start-- they'll be fantastic and shooters won't know what to do because there's no scouting report, but in time; teams will figure it out. 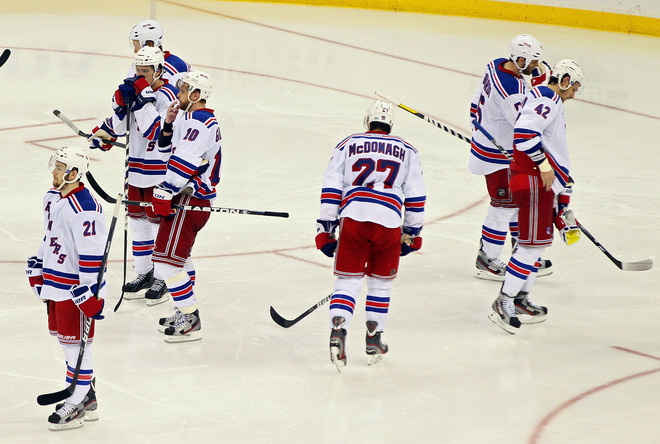 It seems the Rangers are doing that right now, which could be the demise of Capitals. While there's still Game Six and maybe Game Seven to go, the fact that the book on the Caps is pretty cut-and-dried about their blocking style and how they go into a shell after a lead; even if they do get to the next round...they'll be pretty worse for wear in the Conference Finals. From humble begins to a decent college career and a scrambled pro career, this week's AGM could be more notable for his coaching career than his playing career. In fact, many may forget his playing time-- which I wouldn't blame many for as he may not be the most recognized former player turned coach. This week, the profile of Scott Gordon. Gordon started his career in Boston high schools with the Oliver Ames Tigers and then moving onto New Hampshire prep academy Kimball Union Academy. After his prep career was done, Gordon moved on to the Boston College Golden Eagles for his college days, starting in the 1982-83 season, going 3-3-0 in nine games. The 1983-84 season saw Gordon get plenty of time in next, playing 35 games and finishing with 21-13-0 record. Gordon was again the starter for BC in the 1984-85 season, going 23-11-2 in 36 appearances. During the Frozen Four of 1985, Gordon and former AGM Chris Terreri were the first pair of goalies to put water bottles on the top of their net during the triple-overtime game, seeing Providence beat BC 4-3. Gordon's senior year in 1985-86 had a 17-8-1 record in 32 games, to which Gordon got named to the Hockey East First All-Star Team. 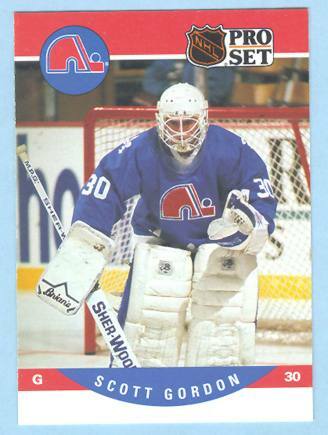 Before the 1986-87 season, Gordon was signed by the Quebec Nordiques, but spent that season toiling in the AHL for 32 games with the Fredericton Express finishing with a 9-12-2 record. In the 1987-88 season, Gordon stayed in the AHL, but with the Baltimore Skipjacks, going 7-17-3 in 34 games. However, the 1988-89 season had Gordon play the majority of the season with the ECHL's Johnstown Chiefs, going 18-9-3 in 31 games, then 7-4 in 11 playoffs games; which helped Gordon get named to the ECHL First All-Star Team. Gordon also spend two games back in the AHL with the Halifax Citadels that season, both losses. The 1989-90 season is where Gordon got some better footing in Halifax and putting up a 28-16-3 record, then 2-4 in the playoffs. Also, Gordon would get called up to Quebec in mid-season for 10 games, going only 2-8-0 in those games. The 1990-91 season was a bit dismal, as Gordon would play only 24 games in Halifax with a 12-10-2 record and appear in 13 games with Quebec, sporting a 0-8-0 record. Gordon would play for the US in the World Championships, losing his only appearance. For the 1991-92 season, Gordon spent the start of it with the United States National Team in hopes of playing in the 1992 Olympics. He played 28 games with the touring team, putting up a 13-12-3 record, while playing on one games in the Olympics, but did not factor in the decision. Once he returned, Gordon played seven games for Halifax (3-3-1) and four games for the New Haven Nighthawks of the AHL (3-1-0). Gordon was a free-agent by the 1992-93 season, opting to play in the ECHL with the Nashville Knights, putting together 13-9-1 record in 23 games, then going 5-4 in nine playoff games. Gordon would move to the Knoxville Cherokees for the 1993-94 season, finishing with a 15-10-1 record in 26 games, while also getting a call to the IHL's Atlanta Knights to play in five games, finishing with a 0-1-3 record. In 1994, Gordon retired and began coaching with the Atlanta Knights as an assistant and would be with the team from 1994 until 1998, when the team was then the Quebec Rafales. Starting in 1998, Gordon got a head coaching job in the ECHL with the Roanoke Express, a post he would hold for two seasons. From the 2000-01 season until the 2007-08 season, Gordon would coach the AHL's Providence Bruins, winning the Louis A. R. Pieri Memorial Award for Coach of the Year in his last season. In the 2008-09 season, Gordon became the head coach of the New York Islanders, but after a couple dismal seasons-- he would be dismissed as the head coach in the middle of the 2010-11 season. Currently, Gordon is an assistant coach with the Toronto Maple Leafs. Gordon has also helped USA Hockey as an assistant in the 2009 World Championships and 2010 Olympics and the 2011 Worlds as the head coach. While he didn't do much for some lackluster teams, the knowledge picked up and the international experience that Gordon was able to pick up was something that is invaluable. With the amount of situations he's been in, it has helped Gordon adapt to whatever is thrown his way. From the two-headed monster in net, to a surprising season to show, to now figuring out how they got taken to the wood-shed by an upstart 8th seed team. The St. Louis Blues did have a small revival of their youth movement from a couple years back-- but the uphill climb is still ahead of them. One of the good things for the Blues this season was to pick-up Ken Hitchcock for a middling Davis Payne 13 games into the season. Hitch got the teams mindset focused on the goal at hand and made them a better team all around. For a team that's still trying to find their identity, the need for someone like Hitchcock was crucial. However, the downside of things could be draw to the Game Two collision in Round One between Barret Jackman and Jaroslav Halak; putting Halak out for the rest of the playoffs with an undisclosed injury. And while Brian Elliott was able to shoulder the load against the Sharks, the Kings seemed to have Elliott's number, making critics talk about Elliott being back to his old mediocre ways rather than the All-Star swagger he had in the beginning of the season. And speaking of Jackman, thanks to this short run-- people realized that he was still in the league, despite him being a -8 in the playoffs. Other than Jackman, the defense for the Blues was middling; with Kris Russell being the top rated defenseman and Alex Pietroangelo not being at 100% after Game Two of the series-- but even so, the Blues could have used a little more veteran experience on the blue line. More veteran experience overall would be something that could have been helpful. Sure, Jamie Langenbrunner and Andy McDonald do have a lot of miles on them, but to have the worry about the rest of that youthful team is something that few players can do on their own and be successful. McDonald, at least, regained his underrated form in the playoffs with five goals and 10 points for his nine games. The upside is that each playoff run, regardless of the length, will help the youth nucleus of the Blues roster for years to come. At the end of the day, the Blues were a surprise team for the season with how they've been able to rise up the ranks of the NHL so quickly. 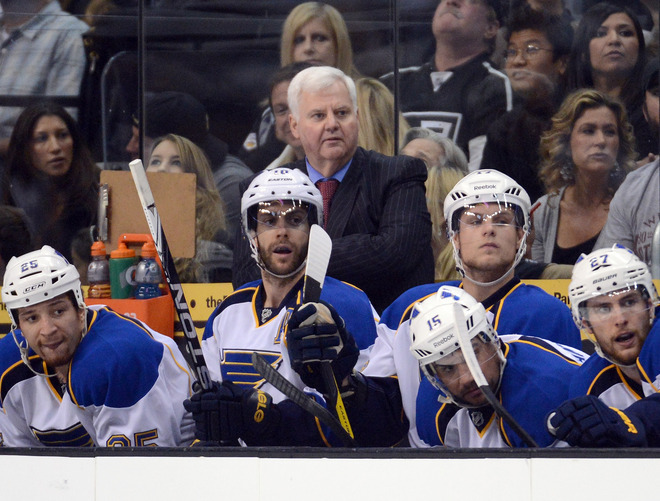 Right now, the focus is on whether or not the Blues can actually maintain this pace and build off this season or whether they'll still need to be reminded of needing an identity next season. After taking the first two games on the road in the first two rounds of the playoffs against the first and second seed in the Western Conference....I'm starting to think that many have slept on the Los Angeles Kings and that this could be unlike other #8 seeds we've seen in the playoffs. The idea that this team would rely heavily on the play of Jonathan Quick isn't all that too far from the truth. However, it seems that Quick's play and the attitude from Darryl Sutter from behind the bench is something that has sparked the all-around play of the Kings. It seems that Sutter won't let these guys rest on their performance from the game before and makes them look forward to the next game immediately after the final horn of the game prior. While some wouldn't respond to it, the Kings have bought into it-- which is odd considering the onus many have put on the likes of Jeff Carter and Mike Richards. Not only that, but the role that Dustin Brown has played, especially considering many thought he would be traded this season, shows that he's not only committed to the team, but also how much of a leader he truly is for the team. Oddly enough, Anze Kopitar has been contributing, but not getting much of a fanfare and Dustin Penner is doing a lot of dirty work on a line with Richards and Carter, most of which will go unnoticed or used as a way to make pancake jokes-- but as long as it get goals and victories-- who cares?? Justin Williams hasn't even got going yet, which is a scary though. It makes you wonder how much the team was playing possum for the season and now finally exploding onto the scene in these playoffs. Considering the fact that the Kings are fifth in the playoffs for goals-for and second in the West; it's a head scratcher. I mean, this team had the lowest goals-for of all the playoff teams and second-lowest in the entire league-- but now they have a four-goal first period of Game Two and are fifth in the entire playoffs?? Mind boggling. Yet, back to Sutter-- the mirage he could be creating with coming into a team and changing things around could be something to look at. While he coached a half-season before his run with the 2003-04 Calgary Flames, it's almost along these lines where the two teams are seemingly unassuming heading into the playoffs-- then really taking everyone by surprise when push comes to shove. The Flames took out the top-three seeds on their way to the Stanley Cup Finals....the Kings could be doing the same thing right before our eyes. While I did say the Kings would be a team to keep an eye on four years ago, the team has taken many different looks, many different goalies, and many different philosophies. The look of the team now is one ready to actually make a lot of noise and do plenty of damage. Just a matter of not letting critics throw them off what they've been doing.